The Virginia Marine Resources Commission strongly encourages gardening and farming of oysters and clams. These shellfish provide important economic and environmental benefits. In fact, a single adult oyster can purge 50 gallons of water a day! And shellfish gardening and farming reduce harvest pressure on wild stocks, while increasing the overall number of shellfish that help clean the water and serve as habitat for fish and crabs. 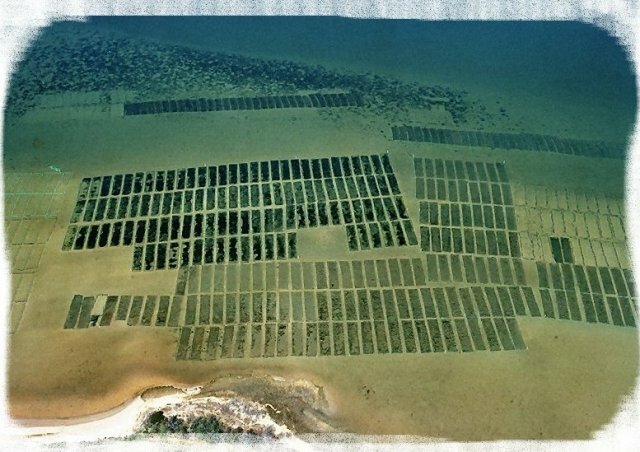 Clam and oyster farming, also known as aquaculture, is a booming, multi-million dollar industry in Virginia. Oyster gardening under private piers and along the shoreline of privately owned waterfront property is becoming increasingly popular among environmentally concerned citizens. In most cases, permits and/or licenses are necessary to set up shellfish gardens or farms. This is to help us ensure fair use of the public waterbottoms, reduce potential user conflicts, head off navigation issues, limit the chance contaminated shellfish are mistakenly taken from condemned waterways, and preserve underwater grasses that shelter juvenile fish and crabs from predators. Our permitting system is formulated around three factors: Do you intend to sell the shellfish you grow? Do you intend to grow shellfish in floats or in cages resting on the bottom? Do you intend to grow shellfish on waterbottoms you lease from the state? If you wish to grow shellfish not for sale at your pier in either floats or cages in the riparian area of the shoreline of your waterfront property (not to exceed 160 square feet in area), you must obtain an oyster gardening permit (General Permit #3) from our Habitat Management Division. There is no cost for this permit. Regulations and requirements for this activity are found at: oyster gardening regulations and permit form. Additionally, if you own upland with a minimum of 205 linear feet along a tidal waterway, you may qualify for a riparian oyster ground lease. More information related to applying for this type of lease may be obtained from the Engineering/Surveying Department (757-247-2225). Placement of cages under this regulation must be marked properly with corner markers and signage. In conjunction with the on-bottom regulation, the regulation for marking requirements can be found here http://www.mrc.virginia.gov/regulations/fr290.shtm. Examples of approved signage can be found here. For the General Permit # 4, a Joint Permit Application form should be completed and submitted to the Habitat Management Division. If you have questions on what permit you may require, please contact Ben Stagg of our Engineering/Surveying Department for assistance. He can be reached at 757-247-2225 or at ben.stagg@mrc.virginia.gov. If you are interested in how to obtain a new shellfish lease contact Ben Stagg above. Note also that the Commission has the following web page that lists individuals that are interested in obtaining or selling a shellfish lease using the lease transfer process: Leases for Sale. You can find a list of pending shellfish lease applications and associated locations: Pending Oyster Lease Applications. Anyone harvesting aquaculture products must have a Commercial Fisherman Registration License (CFRL), Aquaculture Product Owners License, or Aquaculture Harvester License. Individuals with the Aquaculture Harvester License are not aquaculture product owners. Individuals participating in commercial oyster aquaculture must also pay a Oyster Resource User Fee. HARVESTERS - Training is required prior to purchasing VMRC shellfish licenses and permits. It can be completed online. Training is free and takes ~45 minutes � 1 hour. If you have questions about the CFRL, or mandatory reporting requirements, please contact Mr. Rob O'Reilly of our Plans and Statistics Department at 757-247-2247 or at Rob .O'Reilly@mrc.virginia.gov. For questions concerning the Aquaculture Product Owners or the Aquaculture Harvester License, please contact Andrew Button of our Repletion Department at: 757-247-2121 or Andrew.Button@mrc.virginia.gov. Shellfish gardening and farming, also known as aquaculture, has been recognized by the U. S. Department of Agriculture for the positive impact it has in the Chesapeake Bay for removing nutrients and sediments from the water. They have added shellfish aquaculture to the Natural Resources Conservation Service (NRCS), 2010 Chesapeake Bay Watershed Initiative Program. Through this program, shellfish aquaculturists can sign up for a program to be paid for gear cycling and best management practices on their farm. This program is funded by the Virginia Fishery Resource Grant Program, www.vims.edu/adv/frg. It is conducted in cooperation with 10 Virginia seafood companies and in conjunction with private industry which provided realistic expectations and estimates of expenses. Alternative Farming Systems Information Center is a website with information and links for aquaculture. Farming of some finfish may also be permitted in state waters. VMRC Striped Bass Aquaculture Regulation - 4 VAC 20-252-10 et seq., "Pertaining to the Taking of Striped Bass"
The "lead" state agency to promote Virginia aquaculture is the Virginia Department of Agriculture and Consumer Services (VDACS). Mr. T. Robbins Buck (804) 371-6094 is the contact at VDACS for aquaculture information.